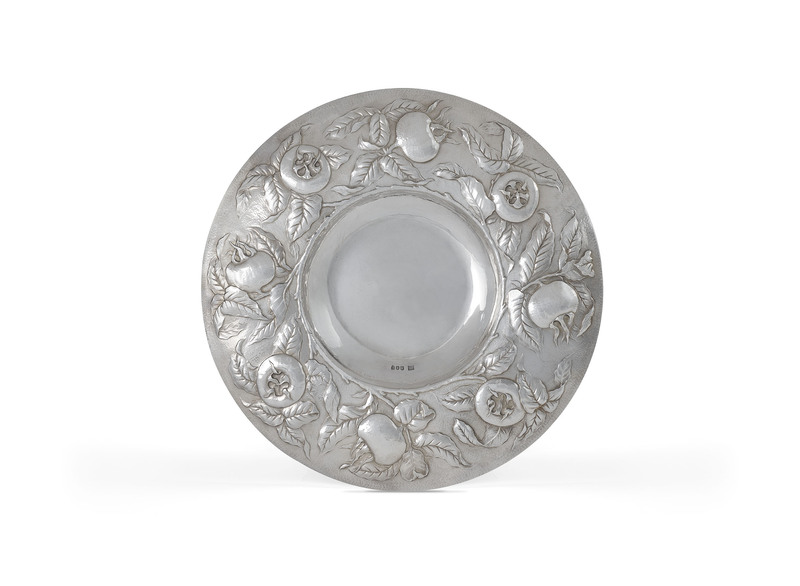 A large silver charger by master silversmith Gilbert Marks, decorated with raised medlar fruit. The eminent art critic M. H Spielmann wrote of Gilbert Marks (1861-1905) that his work was “gifted with a dainty imagination, with pure feeling for form and line and to harmonise all, with a love of simplicity of beautiful objects.” Marks exhibited his work in a number of galleries and exhibitions during the late 19th and early 20th centuries. His first display was held in 1895 in the gallery of Johnson, Walker and Tolhurst on Aldersgate Street, and was met very favorably by critics of the time, receiving glowing reviews in The Art Journal, The Magazine of Art and The Studio. He registered his own maker’s mark at Goldsmith’s Hall in 1896. In 1899, Marks exhibited works at the Arts and Crafts Society and the Royal Academy, as well as a solo show at the Fine Art Society. In 1901, Johnson, Walker and Tolhurst established The Quest Gallery, which would prove a key display space for Marks in later life. In a review written for The Artist in 1898, Gilbert Marks was interviewed about his approach to silversmithing.